Thorn’s LED products are highly energy efficient, helping to reduce ongoing energy costs and carbon emissions for Celtic FC. Lighting in Celtic Way is zoned according to area use, with the iconic central boulevard lit with eight-metre columns and Thorn DYANA LED fittings, and car park areas lit with six-metre columns equipped with Thorn ISARO LED. The Thorn Lighting scheme will require virtually no maintenance for the first six years, helping to minimise operational costs for Celtic FC. 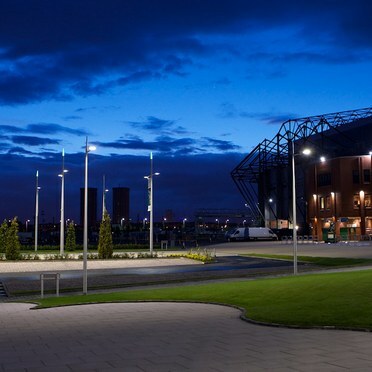 To do justice to the high-profile development of Celtic Way, Celtic FC and its lead contractor Waterman Group needed an iconic lighting scheme. 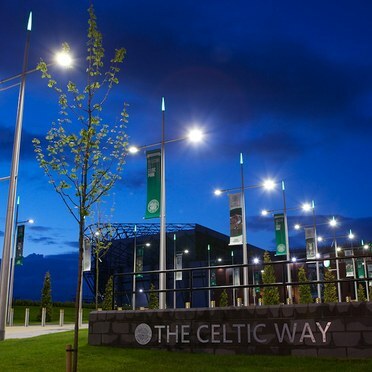 Eddie Murphy, Senior Electrical Engineer at Waterman Group, says, "We wanted lighting that would add to the dramatic features of the new Celtic Way and focus fans' attention on the attractions of the main boulevard. At the same time, we needed striking bespoke columns that reflect the success of the club – all in Celtic green of course." 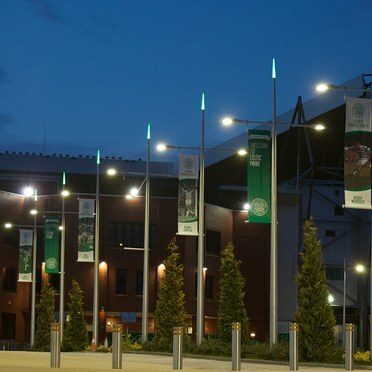 Additional requirements were to light new car park areas to safe levels and to meet Celtic FC's requirement to hang banner ads from lighting columns. The lights also had to be highly reliable, as well as cost-effective and easy to maintain for years to come. Once briefed on Celtic FC's requirements, the Thorn team proposed a solution based on sleek, eight-metre, brushed aluminium columns with illuminated green tips called 'finials'. The bespoke columns are equipped with striking, energy-efficient luminaires from Thorn's Dyana range, with in-built attachments strong enough to hang three-metre banner ads. To illuminate the new car park areas to safe levels without taking attention away from the main boulevard, Thorn proposed a solution based on six-metre columns equipped with Isaro LED luminaires. "The Thorn Isaro luminaires are highly energy efficient and don't detract fans' attention from the main Celtic Way boulevard," says Eddie Murphy. The Thorn products used for Celtic Way were delivered by Thorn reseller MacLean Electrical and on-site installation was managed by local electrical contractor Pegasus Power & Communications. "All the project partners worked together seamlessly to ensure that the project was delivered successfully, on time and to budget," says Eddie Murphy. "Thorn has helped us deliver a hugely impressive, visually stunning lighting scheme that reflects Celtic FC's past glory, current success and future aspirations," says Eddie Murphy. "Celtic Way is now much more than the approach to Celtic Park – it's an attraction in its own right and we frequently see local people and fans stopping to take pictures and admire the Thorn columns and light fittings that line the central boulevard." 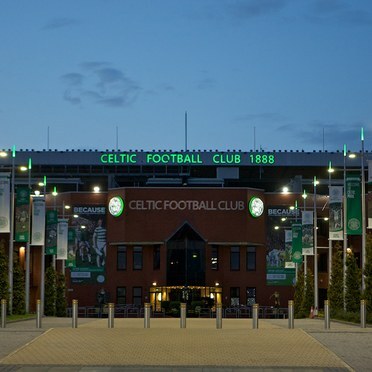 Celtic FC is delighted with the new lighting scheme, which enhances Celtic Way and its attractions. Robin Buchanan, Stadium General Manager of Celtic FC says, "Celtic Way is a stunning new public area for our supporters and Thorn's lighting scheme helps to show it to its best advantage. We will continue to progress and develop Celtic FC in the right direction to show that we are one of the world's leading football clubs and give our fans a club they can be proud of." By using latest-generation LED technology, the Thorn Lighting solution maximises energy efficiency and minimises operating costs for Celtic FC. Celtic FC needed a highly reliable lighting scheme that would deliver week after week, with little or no maintenance required. The fact that Thorn Dyana LED and Isaro LED lanterns need almost no maintenance for many years made them an excellent choice for the football club.